I’ve never been much of a Brad or George girl. 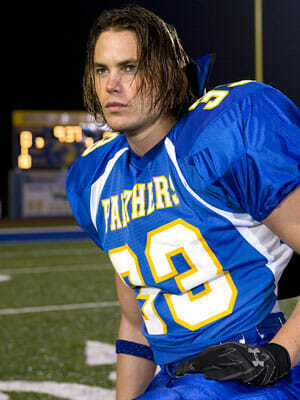 Give me Tim Riggins any day. But I do love their friendship. All the ribbing (see: George’s cane shtick) and laughing and what seems like genuine friendship. Not even a bromance. More than that. They’re buddies, they respect each other, and they wear such damn cute smiles when they talk about each other. 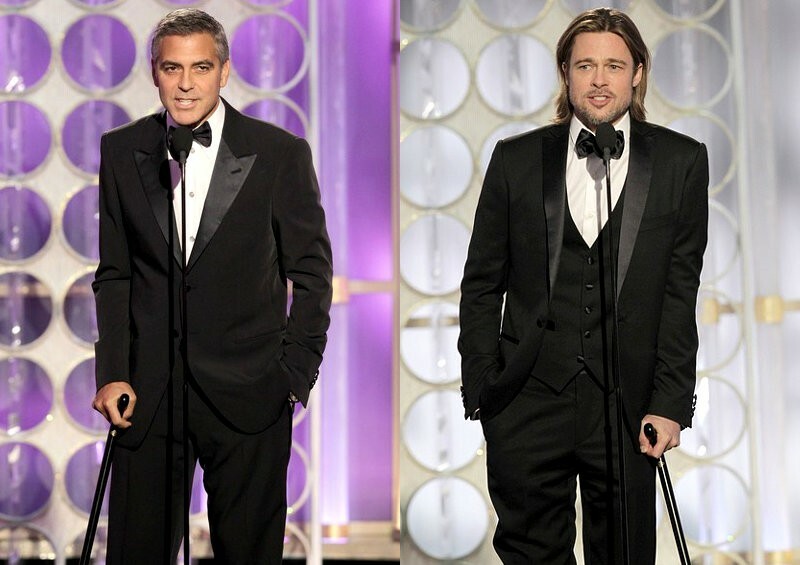 I was discussing over the weekend that George Clooney might be the only person who could have a real friendship-of-equals with Brad Pitt. And vice versa. No one has to be jealous or threatened. They’re both so successful in so many ways that they can just support each other. When a friendship exists with one person who is Brad-Pitt-levels of big dealness, and the other one is, like, me… well that might be a bit tough on the ego. But Brad and George probably go to the golfing range, crack jokes and vent about Angelina and Stacy just like everyone else. Is this the cutest picture you’ve ever seen? I think so. I love that Michelle Williams is always taking her BFF Busy Phillips to awards shows with her. Also, that they’re friends from Dawson’s Creek days doesn’t hurt my affection for them. Whether I should or not, I still feel sad for Michelle Williams when I see her–the whole Heath thing, and she always has a bit of a sad-serious look. So I’m glad she has a tried-and-true BFF who’s always by her side. Also, this picture is so everygirl-BFF. Except instead of taking a pic with her camera phone of, say, an outfit or a manicure, Michelle’s BFF is taking a picture of her golden statue. NBD. 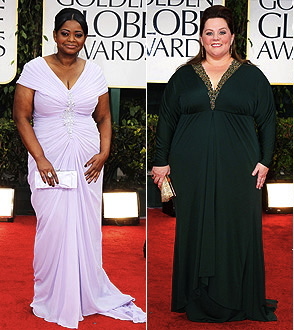 I have no idea if Octavia Spencer and Melissa McCarthy are BFFs. But after watching Melissa cry while Octavia gave her acceptance speech, they should be. Who are your favorite celebrity BFFs? I always wonder what Michelle Williams and Busy Phillips relationship is like with Katie Holmes??! Do you think they are still friends with her (or were ever friends with her)? They seem so normal and awesome and I feel like Katie left that realm when she dumped sweet little Chris Klein for scientology crazed Tom Cruise? Probably something I don’t need to spend my time wondering about…but I do! haha, me too Calla Leigh! Oh poor Joey Potter, what has become of you. Do love that Tim Riggins. Feels a little creepy to be crushing on a high school student, but luckily he’s 30 in real life. I bet Katie is not allowed to talk to Busy or Michelle. It’s always awesome when Denis Leary is on The Daily Show with Jon Stewart. I have no idea if they’re at BFF status, but they’re obviously old friends with a lot of history and it’s so much fun watching them rib each other.